Following a $10 Million redesign, this stylish boutique hotel is ideally situated in the trendiest corner of Ocean Drive known as South of 5th Street or "SoFi." 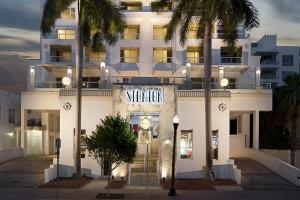 With its beachfront setting, the hotel is a chic, contemporary retreat in the heart of it all. Dive into infinity-edged pools with seamless views of Miami Beach or enjoy sumptuous drinks and food from the outdoor patio at Deco Blue Restaurant. Many of the newly renovated guest rooms and suites afford dazzling ocean views that invite travelers to relax in stylish comfort with upscale finishes.